Synopsis: Due to some mysterious radiation emanating from outer space, the dead have risen from the grave, and are feasting on the flesh of the living. A small band of survivors takes shelter in a Pennsylvania farmhouse, including Barbara (Judith O’Dea), whose brother, Johnny (Russell Streiner) was killed earlier in the day by one of the walking dead, and Ben (Duane Jones), a drifter who’s the only one with a solid plan for survival. But will he execute this plan in time to save them? 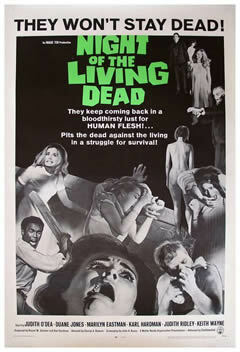 The first time I saw George Romero’s Night of the Living Dead was back when I was in high school, and even though I thought the first 15 minutes of the movie were pretty exciting, the living dead hadn't really done anything by that point to make me fear them. In the first real confrontation between the living and the dead, Duane Jones’ Ben finishes off three walking corpses without too much effort, and the six or seven that were left surrounding the farmhouse didn’t seem like much of a threat. Honestly, I couldn’t see what all the fuss was about. Then, a few minutes later, about a dozen or so dead were hanging around…then two dozen…then about fifty…then a hundred. Before I knew it, “no real threat” had become an impenetrable wall of death. This, for me, is the real magic of Night of the Living Dead, and the reason why its success has never been duplicated: the film is incredibly patient. It works on you, slowly breaking down your sense of security before snatching it away without a moment’s notice. So much for not being scared; after 25 years and about two dozen viewings, I still can’t watch Night of the Living Dead with the lights off. Hey! First off, thanks for the comment. I appreciate it. #3 - I was out of High School when I first saw THE OMEN, so it didn't scare me, but I did find it creepy as all hell. As for BLAIR WITCH, yeah...me too!